The United States is slated to become the world's third-largest exporter of liquefied natural gas by 2020. These facilities will get the party started. Last year, the United States became a net exporter of natural gas for the first time since 1957. Although 77% of exports traveled through pipelines, that's down from 98% in 2012. The rest came from liquefied natural gas (LNG) shipped on specialized ocean tankers. The nation exited 2017 with three LNG export terminals boasting a combined capacity of 3 billion cubic feet per day (Bcf/d). That's a pretty big number, but it will seem laughably small in a decade or so. If investors add up all LNG export facilities that have been approved by (12, including three that are operating) and proposed to (14) American energy regulators, then they arrive at a combined LNG export capacity of 44.2 Bcf/d. Some may never get built. Those that do may not enter service for another decade or more. Either way, it shows the incredible potential of the fledgling American LNG industry. I understand that 44.2 Bcf/d is almost so large it doesn't make sense, but investors looking to gain a foothold in the up-and-coming industry shouldn't feel overwhelmed. Here are five LNG export projects energy investors should know about. 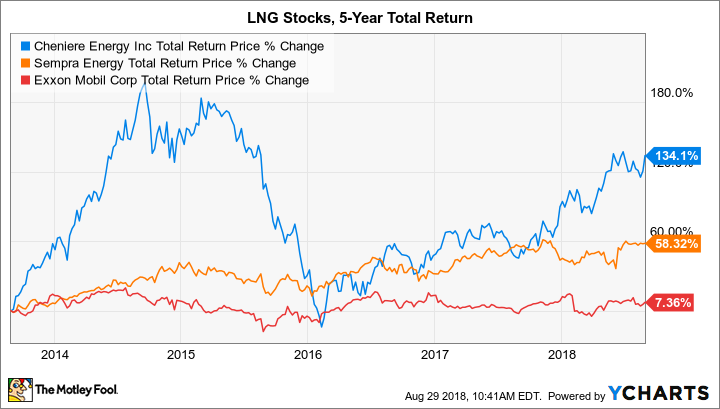 Cheniere Energy (NYSEMKT:LNG) was the first company to make a bold bet on the potential for the United States to export large volumes of excess natural gas. It was risky, but it's paid off in spades. The business posted $3.8 billion in revenue and over $1 billion in operating income in the first half of 2018 -- and that's all from a single -- albeit massive -- facility. In 2016, Sabine Pass became the first new major LNG export terminal in the country. It wields a capacity of 2.8 Bcf/d, although approved expansion projects will add 1.4 Bcf/d. No other approved or proposed facility matches that combined volume, but the list of projects expected to come on line by the end of 2019 includes a few other monsters dotting the Gulf Coast. That includes Corpus Christi, the second facility of Cheniere Energy. Data sources: EIA, FERC, and company resources. While there are also LNG export terminals currently or soon-to-be operating at Elba Island (Kinder Morgan, Southern Company), Cove Point (Dominion Energy), and Kenai (ConocoPhillips), they have a combined export capacity of 1.3 Bcf/d. They're just not going to be big needle-movers for their owners, individual investors included. That's not the case for the five projects in the table above. For instance, Sempra Energy owns a 50.2% stake in the Cameron LNG project, which is expected to bring three production units (called "trains" in industry lingo) on line in 2019. The first two were originally expected to come on line by now, but were delayed. It won't matter much once they're all ramped up: Cameron LNG is expected to export $8.6 billion of LNG each year, plus another $2.2 billion in natural gas liquids and crude oil. And that doesn't include two more production units already approved by the Federal Energy Regulatory Commission (FERC). Not wanting to get complacent with its early lead, Cheniere Energy is expanding the existing Sabine Pass from the four production units already in service. A fifth train is expected to start commerical operations in the second quarter of 2019. Construction has yet to begin for the sixth train, although it has received regulatory approval. Meanwhile, the first two trains at Corpus Christi are expected to start up in the first half of 2019, with a third about to begin construction. Those will be quickly followed by Freeport LNG with the export terminal of the same name. While the company is privately held right now, the customer base for the project shows electric utilities, industrial companies, and Asian countries, in general, are all eager to get their hands on the cheap energy source. For instance, the project will ship supercooled gas to electric utility Tokyo Electric Power Company (desperate to replace its nuclear generation fleet), oil major BP, conglomerate Toshiba Corp, and an electric and gas utility in South Korea. Last but not least is the Golden Pass export terminal proposed by ExxonMobil (majority owner), ConocoPhillips, and Qatar Petroleum. While no final investment decision has been made, the project may be able to come on line a little quicker than most. That's because it's converting an existing import terminal to send gas in the other direction (similar to Cheniere Energy's Sabine Pass facility), which means it has a good chunk of existing pipeline and port infrastructure already in place. Another potential catalyst: it's located in Sabine Pass, Texas, which is home to a lot of LNG process know-how and infrastructure -- something that can't be discounted in the early goings of the industry. While the five LNG export terminals discussed above will get the party started for America's soon-to-be dominance in global energy markets, there are a handful more projects coming down the pipeline. Some of those will test out newer technology, such as smaller or faster liquefaction trains, that project sponsors say will provide industry-leading economics. Some will sport new business models, partly in response to shifting market dynamics that the pioneers avoided by locking in long-term contracts. The main takeaway is simple: Energy investors should get familiar with the LNG industry because it's here to stay.